« simply senses–five senses friday–a day late. This weekend I shot the volcano but we decided to go to the local cannery and ask if I could get some shots of the eagles, there were hundreds. They were really nice and let us come by the big NO TRESPASSING sign. This one was my best shot and I am declaring it my BSM! Do you think I can count him as one of my 100 strangers shot? I am getting braver, I was closer! 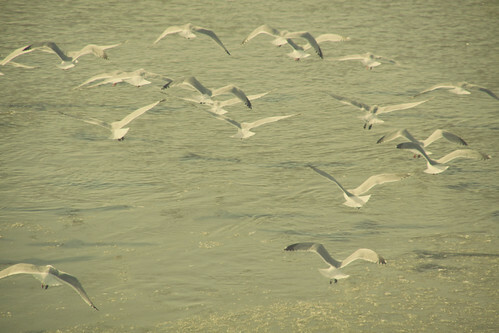 In Alaska when you start to see seagulls it means it is spring. There is ice chunks the size of Volkswagens, snow on the ground, no green other than spruce tress but still it is a sign of spring. Thanks for stopping by the benson family! Wow. Those are amazing. I bet it was amazing to be that close. These eagle shots are amazing, Leaca! I love them. That’s nice the cannery folks let you take photos. 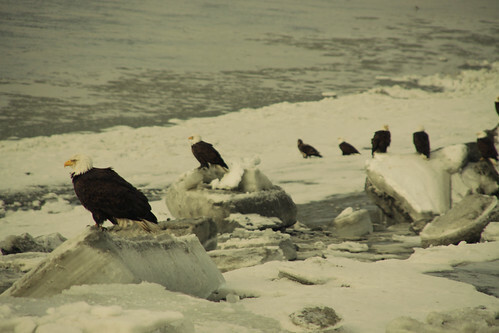 Holy crap, I heard about Alaska having a ton of eagles, but I never expected this. They are hanging out like seagulls. Incredible. I am going to have to come visit Alaska! WOW! That must have been absolutely amazing to see those eagles! @ Natalie yes, it is quite different from what I am used to as well. In Wyoming it was tulips coming up through the left over snow. @Jen I am used to it now. They are everywhere here. Where there is dump, fish, canneries, there you will find eagles. 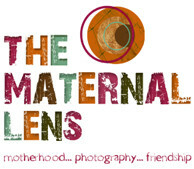 @KJ The 100 strangers is a hard project. I have decided it is good for us as photographers to do this because we have to be bold enough to pretend like we know what we are doing. 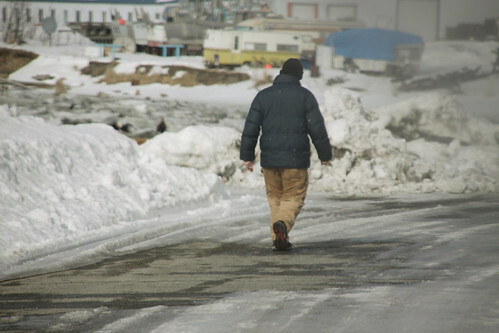 I found a blog not too long ago, a guy from Europe somewhere, came to Alaska, to the “end of the road” and stopped in to the Russian village and took some shots of them. They were amazing. I want to be brave enough to go there. @DebbieT and Christina There are tons here, you get used to it. you may be used to those eagles, but wow…i’m sure not — great first shot! @ megan I think at first I was in a state of shock seeing so many but now I am not. It does not take away the humility I feel when I watch nature. It is amazing to me. I had a friend in Australia that said she does not get excited to see kangaroos. I can’t imagine that….I would be out of my skin! Wow! What a fabulous capture!!! OMG – soooooo gorgeous. I’ve only seen one eagle before and he was soooo high I couldn’t get a capture. how lucky you are to live near that beauty. absolutely breath taking and stunningly beautiful !!! 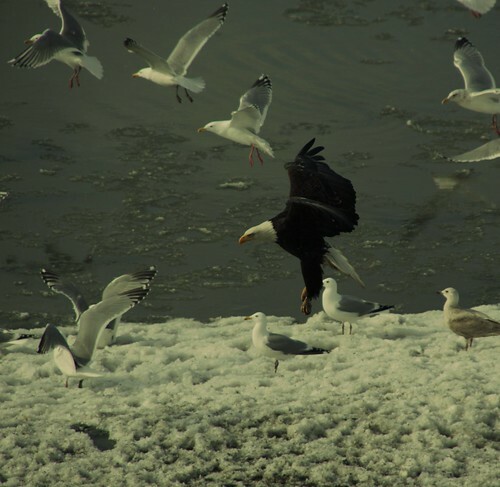 what great shots you got of the eagles and the gulls together. 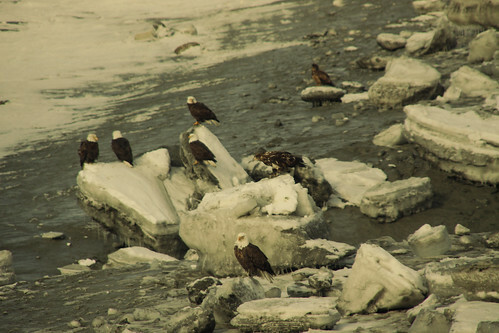 How amazing to see so many bald eagles in one spot! sure, you can count him! love the first and last bird pics! great action shots! These are all terrific. I especially like the last two. Gotta just say ‘wow’ seeing so many eagles at once. Wow those are amazing! I don’t think I’ve ever seen an eagle like that before! Nice captures! Eagles are so beautiful and you captured them wonderfully. I always wanted to do the 100 strangers project too. I simply do not have enough guts to do it. I would have to be really coy and stealthy to get through it and have my 3 year old by my side! I wish I could be more bold…..Gotta work on that…..
Wow Leaca, these are fantastic! In looking at these it made me think, I may be tired of brown but you’re still looking at white! And I was feeling bummed about all the people with magnolia shots lately – it’s all about perspective isn’t it. Love your eagle shots! Really fantastic! 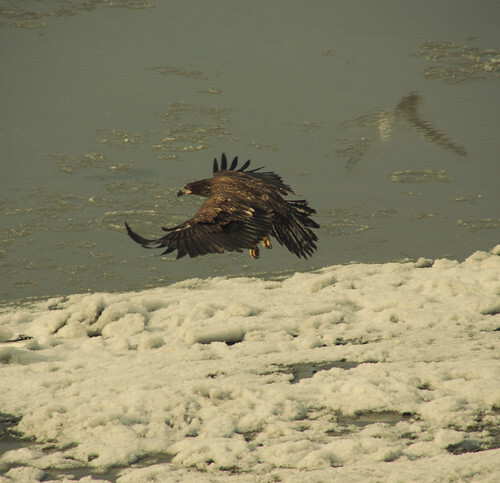 We get eagles here between Nov. and Feb. but weren’t able to get close enough for any good shots. Oh man, you are doing the 100 strangers project? My hat is off to you. I think that shot counts. I was just reading a blog the other day, and the person had been in a city and took pictures of the backs of people all day long. Wish I could remember where I saw that. It really was cool, and not nearly as frightening as taking someone’s photo face-on or asking them if you could take their photo. these are amazing and breathtaking! @ smoothpebble If you think of that blog name let me know. I would love to check it out. 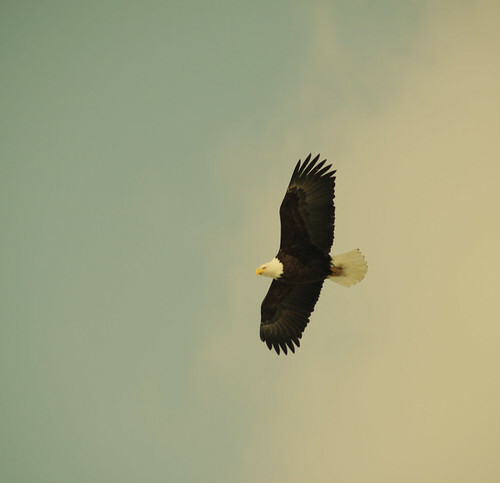 LOVE, LOVE, LOVE the pictures of the eagles… they are so beautiful, aren’t they!? We live in the Mississippi and love to see them, its a part of our world here and we love it!